If you wanted to sum up the past decade of the news ecosystem in a single phrase, it might be this: Everybody suddenly got a lot more freedom. The newsmakers, the advertisers, the startups, and, especially, the people formerly known as the audience have all been given new freedom to communicate, narrowly and broadly, outside the old strictures of the broadcast and publishing models. The past 15 years have seen an explosion of new tools and techniques, and, more importantly, new assumptions and expectations, and these changes have wrecked the old clarity. 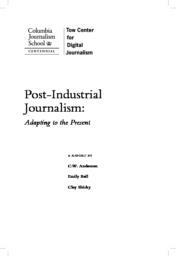 Many of the changes talked about in the last decade as part of the future landscape of journalism have already taken place; much of journalism’s imagined future is now its lived-in present. (As William Gibson noted long ago, “The future is already here. It’s just unevenly distributed.”) Our goal is to write about what has already happened and what is happening today, and what we can learn from it, rather than engaging in much speculation.